Beyond connectivity: a new digital divide. Five years ago, maybe even two, you wouldn’t have considered all the generations would be so connected, and social. Today this atmosphere is the norm on a lazy Sunday in a western, first-world nation. Lots of us are online and connected, frequently outside our homes. And it’s not just the tech-elite or upper crust that are connected. The rest of the world is catching up. As we peer into the future, it is not about who is connected that separates us, but how they are connected. In his talk at the National Press Foundation dinner last month, Google Executive Chairman Eric Schmidt presented this new kind of digital divide, wrapped up into three distinct groups: ultra-connected people, the connected contributors and the next five billion. Ultra-connected people are the tech elite, for them technology will disappear and become a part of everyday life, just like electricity. Imagine a seamless connectivity where computer cables are as old school as having a home telephone. 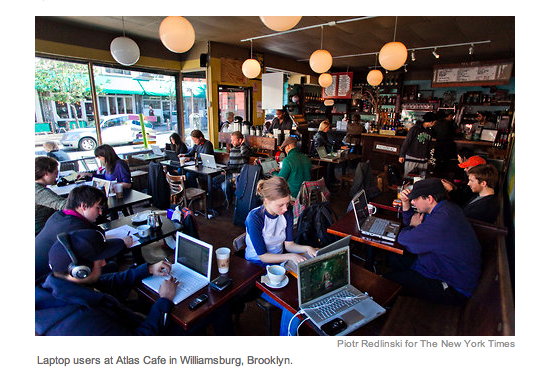 Connected contributors are the middle-class digital natives who inhabit the mainstream spaces of the web. They have learnt how to subvert government restrictions and highlight actions that otherwise would have remained hidden, crowd-based platforms/models like ushahidi, Kickstarter and The Awesome Foundation are their online watering holes. Yet despite connectivity spreading its way to the remote corners of the world, is the gap between top and bottom actually closing? Getting everyone connected is no longer the end point – was it ever? – instead, it opens us up to a variety of more complex, interconnected problems. When you and I are able to join and participate in more advanced ways than others, what role or responsibility is ours in determining the direction of this network of machines and minds? Are those at the top contributing or influencing ‘the collective intelligence and the global conscience’ more than others? Well, it was a lot to think about for a Sunday. Which begs the question, are the ultra-connected set paying attention? You only need to look around this cafe and consider the local population’s obsession with Angry Birds or Facebook notifications to see that deep thinking and consideration is frequently taking a back seat at the top of Shmidt’s connected tree. But I do love his utopian description of developers as the engineers of human freedom. Armed with unlimited processing power, vast amounts of information, and widespread manufacturing capabilities, being ultra-connected gives us pretty much any solution we desire. The added layers of complexity that connectivity brings are easily escapable by short-term distraction, and for those that recognise it, are a unique opportunity to help shape what comes next in our digital world.